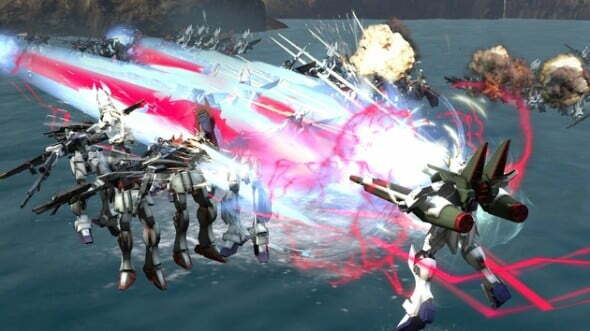 “Dynasty Warriors: Gundam Reborn is a delight of the senses that offers you up polished, responsive controls that make taking down the evil Zeon forces a sheer pleasure.” Find out why we enjoyed Gundam Reborn so much in our full review! The Gundam franchise has delighted those embracing it through both television and manga for over twenty years. There’s a tremendous amount of love and fandom towards the property, so it’s not surprising that in recent years a wealth of Gundam games have flooded the marketplace. These games in past years for a myriad of reasons, largely haven’t clicked. Whether it be them largely having clunky controls, not having the right tone, or worse, that it doesn’t really feel like you’re operating these iconic mechas. Fortunately, there finally seems to be a game that is worthy of the Gundam title, just who would have thought that it’d take combining the series with the sensibilities of a scrambling franchise like Dynasty Warriors to do it right? Granted, this isn’t the first Dynasty Warriors/Gundam collaboration, but it is the one that feels most fully realized and will have you genuinely excited to be tearing robots to shreds. 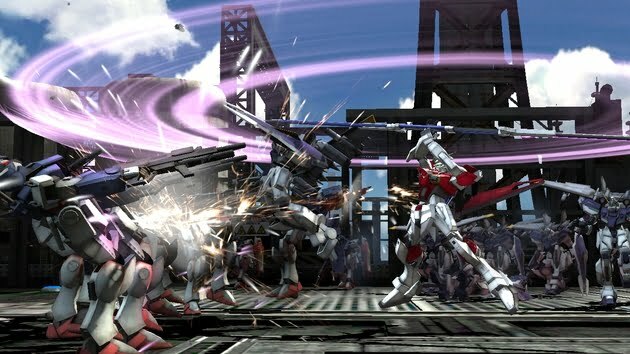 One of Dynasty Warriors: Gundam Reborn’s greatest assets is that the title is so damn fluid and truly feels wonderful as the gaming experience just pours out of your hands. Yes, blasting away mechs ad infinitum can feel repetitive at times (although I don’t seem to recall Amuro Ray ever bitching that were just too many Gundam out there in this stupid space war! ), but this feels more a crit of the hack-and-slash genre at large than this game specifically. At the least, it all looks beautiful and handles superbly simultaneously which makes this less of an issue. In the past, the appeal of pummeling Chinese warriors in the main Dynasty Warriors series never proved itself to me, however, beam swording or lasering hundreds of robots in succession is immensely appealing here, and pulled off seamlessly. For someone who’s never really given the Dynasty Warriors series a chance, it’s nice to visit that sort of gameplay, but with a totally different “world” and focus. There’s a simple, basic control scheme in place here that lends itself to the chaotic hack-and-slash mechanics that you can’t help but smile at. Fluid, simple gameplay makes this sort of mecha acrobatics a piece of mecha cake! In a game like this, the sheer amount of Gundam included is going to be a pretty big sticking point, so it’s pretty fantastic that you’re able to play through pivotal moments in most Gundam series, and pilot a crazy amount of mech (over 100; like, seriously, nearly every Gundam of all time is available here) from most of the series. There’s also a healthy amount of Gundam to unlock and upgrade too, so for fans of the series that are eager to see missing, and rarer mech suits make an appearance, there’s much to appreciate here and you likely won’t be disappointed. It is worth mentioning that the game does feature some rather pricey DLC in order to obtain all of this Gundam magic, and for the completist looking to have it all, the $30 price tag on all of the extra content, plus the initial price of the title may be too much for some. There’s some absolutely beautiful, crisp graphics on display in this title, whether it’s showing off the Gundam or their attacks and effects. It’s some really flashy, crazy stuff that heightens your battles for sure. In terms of the backgrounds and arenas that you’re doing your fighting in, they’re reasonably varied to the point that they help reduce the tedium and repetitiveness of this genre as much as possible. That being said, when a lot is going on at once in the game, it can sort of look like a PS2 iteration from the franchise when things get overloaded. It’s never to the point that it becomes distracting or pulls you out of the addictive gameplay though. When it comes to the rest of the game’s aesthetics, the audio, there’s a surprising letdown that occurs. While the tunes in the title appropriately make you feel like your trudging through the villainous Zeon forces, they’re fairly bland and uninspired. It’s kind of surprising and confusing why more (or any) iconic tracks from the respective Gundam series (for which there are many) aren’t used here. You have existing music at your disposal. Even using some music from the unrepresented Gundam series (I’m looking at you, “Wings of A Boy Who Killed Adlosecence” from Gundam Wing) would have been a nice nod and ways to include more fodder. Then again, why not just upload your own “Best Of” Gundam mixtape and create your own soundtrack? Another audio element that didn’t bother me much, but could be a huge contention point for a lot of gamers is the game keeping the original Japanese audio and adding English subtitles, as opposed to re-dubbing and casting it all into English and simplifying it for gamers. Again, if gameplay is your focus here, this is hardly a dealbreaker, but there are some people where it very strongly could be. This franchise has a strong fanbase of purists though, so at least maintaining the original audio will win points over with them. Dynasty Warriors: Gundam Reborn’s main game is broken up into “Official Mode”, which sees you working through your story, which is made up the plots from Mobile Suit Gundam, Zeta Gundam, Char’s Counterattack, Gundam Unicorn, Gundam SEED, and Gundam SEED Destiny. If the story of these anime is not the priority of your interests, and you’re just craving intense gameplay, “Ultimate Mode”, offers you up over twenty random, original story arcs where you’re in control of your pilot and Gundam. This feels a little less polished than Official Mode, but with it being less structured and more up to you, that isn’t exactly surprising. And they still manage to use a connective theme through each story arc too (emphasis on time, killing enemies, stealth, etc.) If anything else, it’s pretty deliriously delightful to see Gundams from all eras intermingling anachronistically, as all-out warfare breaks out. This also goes to some lengths to adding replay to the game, as you customize these missions as you see fit. There is a weird degree of focus on the Gundam SEED series, which feels more of a response to the series particular resonance overseas that can be a little overdrawn at times if you’re not a megafan and gung-ho with the material, but this is a minor quibble on a game that does indulge many different Gundam series still. Imploding hundreds of Gundam at once is just par for the course here as you zip through space. There’s an encouraging strategy element slowly woven in through the gameplay as well, where you’re completing objectives like securing bases and rescuing factions, so the game doesn’t level out at you simply mindlessly killing as many enemies as possible; you’ll be checking your radar, analyzing maps, and having to make important decisions in boiled-down timeframes before you slash-slash-slash in experiences that actually fairly accurately replicate the frenetic Gundam battlefields that people have enjoyed on television for over the past twenty years. Part of this strategy element, and one of the components of the title that doesn’t exactly come together as effortlessly as the rest of it, are the upgrading and leveling up systems that are in place. These end up becoming a little frustrating as they depend on you receiving plans (to update your various components: melee, thrusters, armor, etc) and parts (to upgrade your weapon). Since these plans and parts are given at random, you’re essentially helpless and not in control of acquiring the things you need, and as the later upgrades become more difficult to obtain, you can kind of be stuck waiting here, with nothing to do about it. It seems that harder difficulty gives you better parts, but it’s still largely random. There’s also a (tacked on) collectible card system that is also used to collect parts, which feels underbaked, albeit fun enough. That being said, if you’re eager to unlock everything, needing to brave through this unnecessary component of the game could prove to be tedious. While it’s also appreciated that the game attempts a co-op system, because who wouldn’t want to be causing robot carnage alongside their best friend or stranger, but it’s very buggy and problematic. The co-op system forces players to drop out at the end of a mission, causing a lot of restarting and time-wasting, let alone both players need to be done the entire respective story arc if they want to play any of the chapters within it here. It’s a nice idea here that it’s a shame that this feature isn’t a lot more polished. 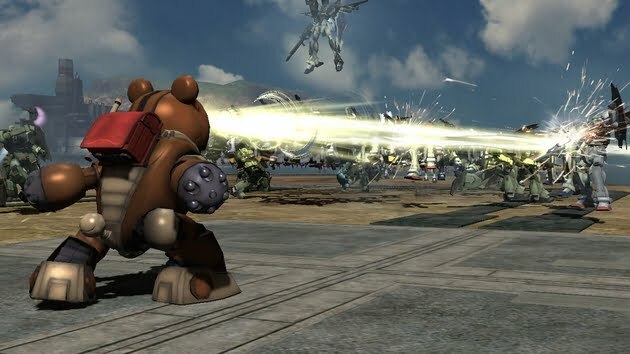 With an impressive roster pulling from most Gundam franchise, even robots like Gundam BEAR come out to play! Only he can prevent Gundam forest fires! For a game like this, there’s an obvious audience built into it already, but a larger question to ask is whether something like this is enjoyable if you’ve never seen a Gundam series before. This game is so Gundam heavy, that that’s essentially like asking if you’d enjoy a DragonBall fighter that boasts that it has over 100 characters, but you’ve never watched the show before. Well, if you’re a fan of fighting games there, and hack-and-slashers here, there’s still something to take away from this. Being a fan of the respective series will only heighten it all. And once again, if you are a fan of any, or all of the various Gundam endeavors you’ll surely eat up this dazzling, frenetic love letter to the franchise. Dynasty Warriors: Gundam Reborn is a delight of the senses that offers you up polished, responsive controls that make taking down the evil Zeon forces a sheer pleasure. Impressive graphics, a huge roster of pilotable Gundam at your disposal, and story modes that cater to die-hard fans as well as Gundam virgins help this title truly excel and be a proud product of its franchise. Incorporating layered strategy elements to the game also breaks down the tedium of standard hack-and-slash fare and offers you up a little more. Lazy efforts taken in regard to blasé music choices, an overly complicated upgrading and leveling up system (not to mention a nearly entirely unnecessary collectible card game), and expensive DLC hold this game back from being the true gem that it could be, but as it stands, it’s still one of the most enjoyable Gundam games on the market, and it actually captures the feeling of being in the pilot’s seat.